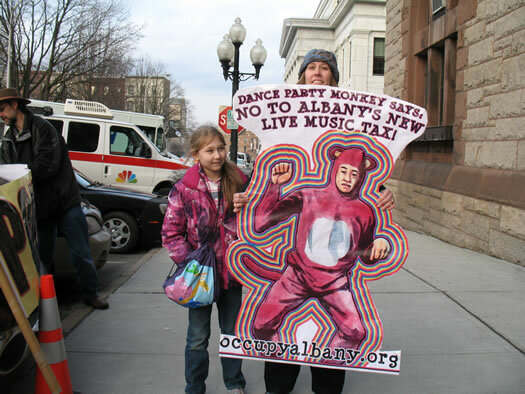 Occupy Albany showed up outside city hall to protest the proposed ordinance, calling it a "live music tax." 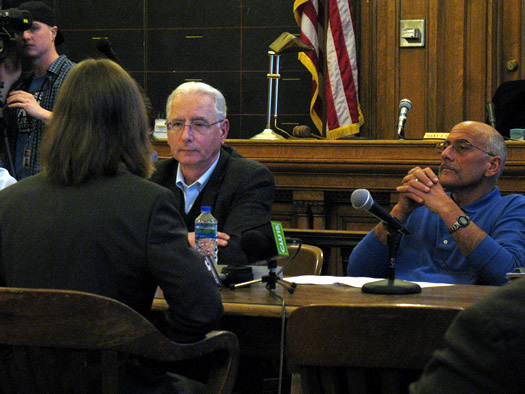 The Albany Common Council's planning committee heard public comments yesterday evening about the proposed cabaret law that's gotten people in local bar/restaurant/entertainment circles fired up. A recent revision to the proposed ordinance for licensing venues with amplified entertainment seems to have addressed a lot of concerns -- notably that the licenses were too expensive. The new version includes fees as low as $150/year for places selling alcohol, and $50 for those not selling alcohol. Hudson River Coffee House owner Anton Pasquill commenting during the meeting, as council members Daniel Herring and James Sano listen. + One of the biggest issues still causing concern is how churches would be affected by the licensing system. Council president Carolyn McLaughlin expressed concern that the ordinance as written isn't clear enough about what sort of church events would need licensing. Patrick Jordan, the city's corporation counsel office, said 99 percent of church activities wouldn't need a license. But the issue came up in a few of the public comments. As David Metz, the treasurer for the Unitarian congregation on Washington Ave, said during his comment: "If Albany Pro Musica performed the Requiem at the the Cathedral, they'd need a cabaret license [under this proposal] -- that makes absolutely no sense." And as he noted about most religious orgs in the city: "We're not noisy people." + Ken Young, from Emack and Bolio's, commented that he's concerned about confusion over how outdoor events would be licensed (the ice cream shop has a yard that it uses during the summer). But overall, he thought the proposal was fair. And as he told WNYT: "For a coffee shop, if $50 a year put you out of business, I think you might be going out of business anyway." + Anton Pasquill, the owner of the Hudson River Coffee House, told the committee he was happy to see some of the changes, but he was still concerned about some of the technical details related to noise -- specifically that some of the provisions about acoustic instruments and amplification didn't really make much sense in practice. He proposed a simpler standard for noise: "It's like a house party with kids -- if you can hear it outside, it's probably too loud." + And there was some continued concern about cost. Bob Rosinsky, the vice president of the Capital Region Blues Network, said he was worried about the effects of the licensing costs on venues, and ultimately on performers. "If this goes into effect, I'm sure it's going to hurt bands." And as Kevin Marshall, who's performed at Laughs on Lark at Elda's, pointed out in his comment, even a relatively small fee can be a burden for a small business. Jordan said his office had gotten a lot of comments via email -- and it's been scanning reaction on Facebook. He said the latest version of the proposal tried to take into account much of that reaction. And he addressed one of the underlying issues in all this: a lot of venues are currently in violation of the law and the proposed system is a way to get them in compliance without going to court. Also, yesterday there was an important clarification: councilman Daniel Herring, who proposed the ordinance, told the Times Union yesterday that the ordinance wouldn't cover spoken word events, like comedy or trivia. The full Common Council could vote on the proposed ordinance February 23. "Patrick Jordan, the city's corporation counsel office, said 99 percent of church activities wouldn't need a license." As David Metz pointed out, that's not really the case. The 99% (can we put like a ten-year moratorium on adults evoking that number?) betrays a fundamental ignorance of the kind of events that occur at churches. Even a church mixer, with the current wording, might fall under the jurisdiction of its legislation. My recommendation was and is that they just strike it out. It was shoe-horned in by a committee member using anecdotal evidence to qualify it, but that's like getting cut off in traffic and trying to get a law passed to make it harder for drivers to make lane changes. Even if it is only "1%," it's an unnecessary hardship on a church and wholly unnecessary. Calling the new zoning ordinance that specifically seeks money from business and community organizations a "tax" is not a fundamental ignorance or deliberate misrepresentation of the issue. This "tax on local business" will get passed on to the community. If a business incurs a $500 fee in order to host live music, that business will likely pass the cost on to patrons by raising door fees. This is an unnecessary squeeze on an already fragile arts and music scene. Furthermore, the higher fees would apply to buildings that have a high capacity, such as churches, community centers, and VFW halls. Many of these places may not afford the license and will therefore refuse to book small concerts, dance events, etc. This is unnecessary. It essentially acts as a tax. Why bother to make churches pay money in order to host a musical event? Why does money even come into this if it is simply a zoning or noise ordinance issue? Because it is a tax... a way to raise revenue. Whether or not this is the law's intent, it IS the effect.